Lacie Jane loves to eat! She is not picky in the slightest and eats plates full of broccoli and kale chips with the enthusiasm that I (and most normal people) reserve for birthday cake! If you ask her what her favorite food is she will say, "Cheese!" And she means it! With that being said, she is a typical child, and she love love loves to eat treats in addition to her healthy meals! 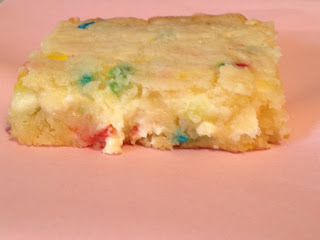 These Funfetti Cookie Bars are one of the easiest recipes you will ever make (I promise), and they are DELICIOUS! I get so many compliments on them from children and adults alike! Now don't get me wrong, I love baking and cooking from scratch. There is something very rewarding about spending a few hours in the kitchen whipping up something delicious. Yesterday, I shared with you a recipe for Red Velvet Cupcakes. They happen to be one of my favorite "from scratch" recipes. But sometimes you need something quick (because whatever your life looks like, I am sure that you are juggling a lot of responsibilities at any given moment)! Or you want something easy because you just don't love to bake. Well that is where this recipe comes in! 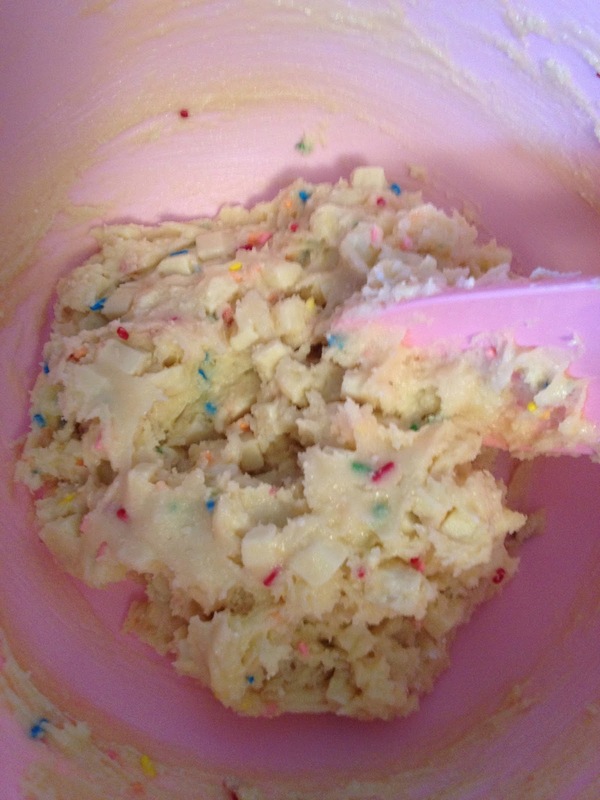 This happens to one of my very favorite "from a mix" recipes. Yup, that's it! You don't even need measuring cups! Your batter will look like this! After 20 minutes you could be finished but I feel that there are a few more key steps to making these AMAZING! Take the pan out of the oven. Use the back of a spatula to press down the cookie mixture into the pan...esentially making it flatter (like you would do if you were making rice crispy treats). Allow to cool completely in pan...at least 1 hour! 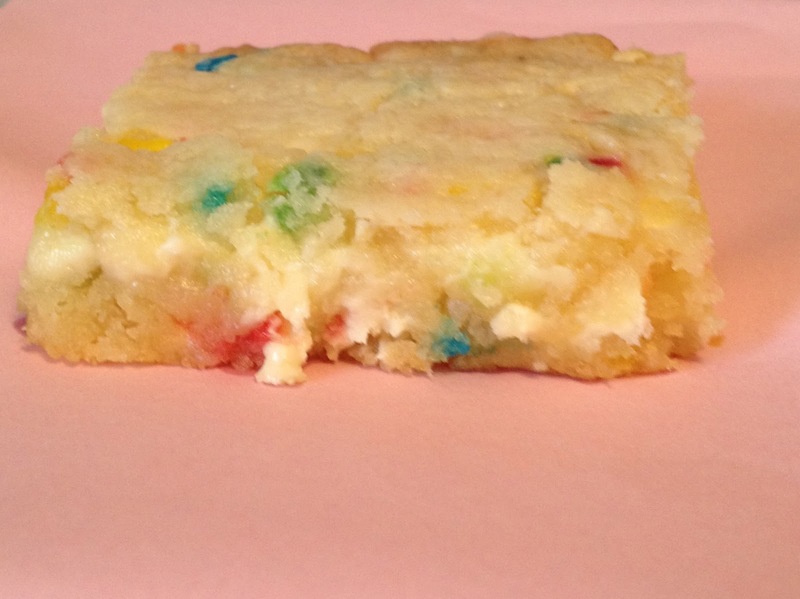 Here is a close up of one of the Funfetti squares! They taste even better than they look! Now, if you don't have white chocolate chips, you can always substitute plain chocolate chips! I have done that many times and it is also wonderful! 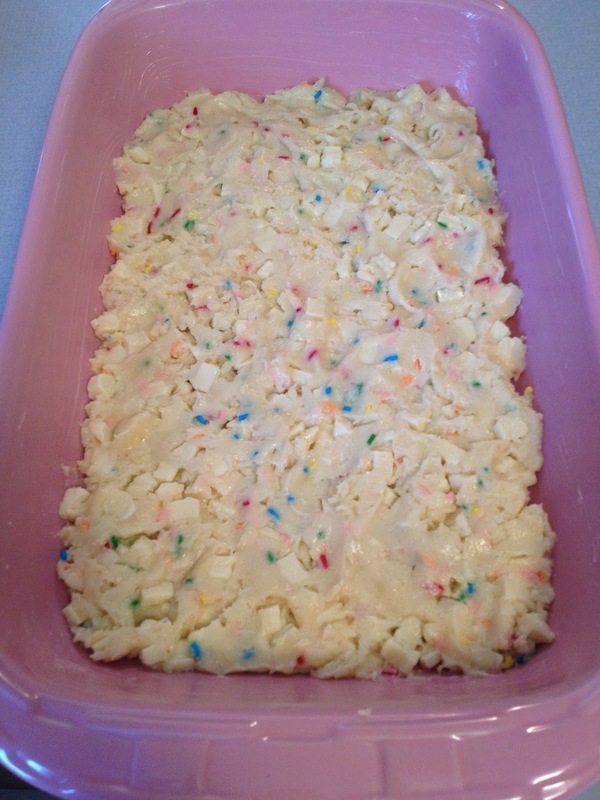 However the Funfetti and White Chocolate is my favorite combination! Whip up a batch this weekend! You will not be disappointed! 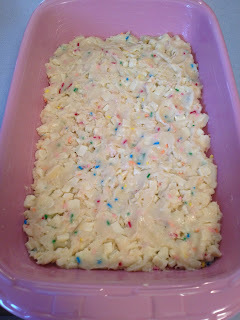 For this recipe I use a pink Longaberger baking dish that is no longer for sale. Here is a similar one available at Sur La Table! 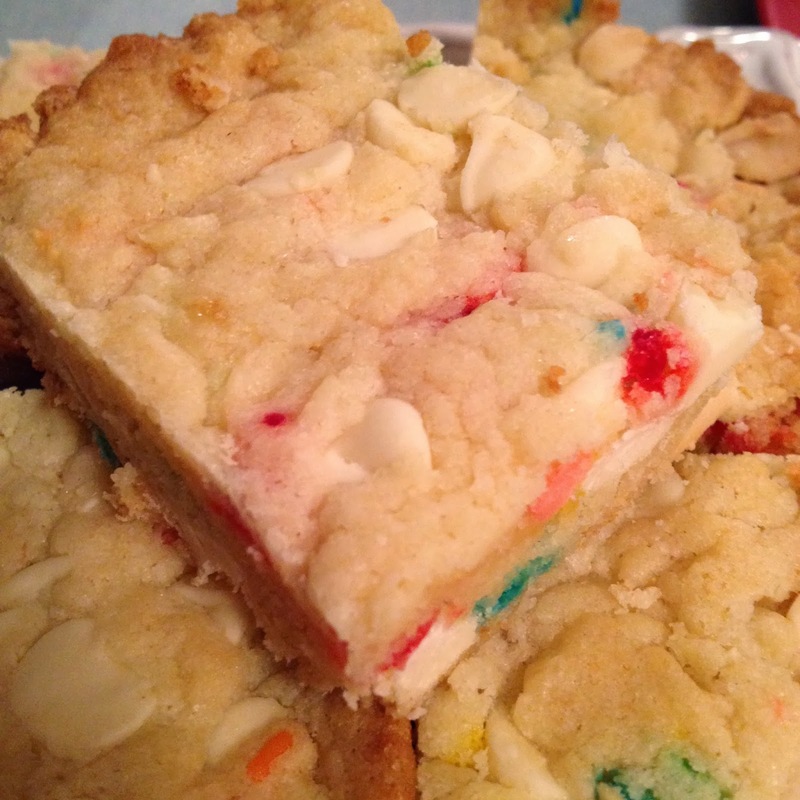 You want to make sure whatever you bake these bars in is the type of dish that is okay for a knife to cut in the pan.